Dixie has found her forever home!! 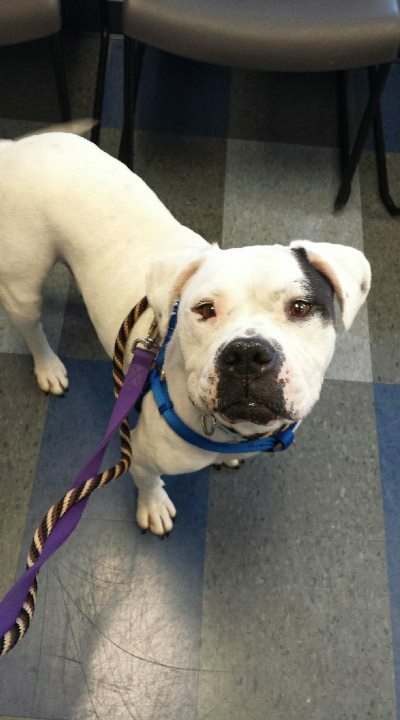 Dixie is an American Bulldog/ American Pit Bull Terrier mix. She is guesstimated to be between 18 months old- 3years old. She was known as “Tutu” at Chicago Animal Care and Control. She is a Safe Humane Chicago Court Case Dog and comes with lifetime in-home training if needed. She and another dog were found abandoned in a yard in deplorable conditions. Dixie is very sweet and affectionate. She is 100% crate trained and house broken. Easy to walk. She is super affectionate and does need time to warm up to new dogs inside of a home. She ignores them on neutral territory. She is super chill and low key. We are learning more about her and will have more information as it comes. She is still recovering from Upper Respiratory Infection but has tested negative for CIV. She has been in ISO boarding and is now currently in a temporary foster home. She will be spayed when fully healed. If you are interested in fostering, please complete our foster survey form. If you are interested in adopting, please complete our adoption inquiry form. Application, screening and home visit is required before an adoption can be approved. Inquiries must be within a reasonable distance of Chicago, IL. No out of state inquiries accepted.